The Threadbare Couch: 300th Post Bonanza: Etsy Interview & Giveaway!!! 300th Post Bonanza: Etsy Interview & Giveaway!!! Wow, I'm so excited! Turns out my ***first ever giveaway*** is also my 300th blog post (cue video montage playing to "What A Wonderful World"). I've shared a link to Etsy for quite a while here at the ol' couch, and it is my distinct pleasure to share a lovely conversation I had recently with two deliciously quirky ladies who operate an online Etsy store. I have a couple of reasons for interviewing them. Times are tough, people. Times are tough. If you've ever thought about turning that random skill you have into some cold hard cash, this is a great opportunity to hear a little bit about how and why these successful ladies did. It's possible that your very own little online Etsy shop could be a great creative avenue - as well as an extra source of pocket money. These ladies are also kindly GIVING AWAY A PAIR OF HANDCRAFTED EARRINGS. So if you're interested in winning and wearing their earrings, I'd like you to hear a little bit of their own voices. But because I really, really like listening to the rhythms of the seasons, the extra cool thing about these earrings is that they're so quaintly nostalgic. It's back to school, and every year at this time I have to restrain myself from buying college-ruled notebook paper and Elmer's glue and blunt, rounded scissors. I love nurturing your inner child. I love nurturing my inner child. And I love nurturing your inner scholar - as my college roommate Sarah did when she put on her non-prescription "smart glasses" to get in a studious frame of mind. So here's a hilarious interlude with Ellen and Kim, "bestest of pals," and owners/creative geniuses behind Loverly. 1. What made you shift from "I love antiques and fleamarkets" to "let's make and sell things on Etsy"? ELLEN: Well, it all started one day when we found this dirty storeroom in the back of a sweet little shop. Kim and I looked at each other and in that way that long-time friends have, we knew what the other was thinking... “We could magically transform this place into a fantastic shop, just like the ones we love to visit!” And sure enough, after months of scrubbing and painting and red dust up our noses (now there’s a funny story! ), we opened Loverly. The natural progression of that was putting our things online on Etsy. KIM: I have always been a "maker." I credit my girl-scout leader mom who always had craft items on hand and we ALWAYS made Christmas presents. So when we do the flea-market scouring, my first thought is usually "What can I make with this?" (My art room is full of items waiting to be reincarnated.) And I had already established an Etsy store to sell my hand-crafted lampwork beads, findings and jewelry (kimnelson.etsy.com) so we were familiar with what's involved. The difference with this store is it became a joint effort between my wonderful friend Ellen and myself. 2. What are the pros and cons of hosting an online shop on Etsy? ELLEN: For me, all pros because I have my wonderful pal Kim, who’s a complete workaholic, incredible organizer, and beautiful designer. Okay, so I’ve thought of one con. And that’s trying to keep up with the amazing photos other artists post. Wow. KIM: The pros are we get to reach a much larger audience than we do with our little shop. I love the Etsy community and finding like-minded people all over the globe. The con is, quite frankly, it's a lot of work to do it 'right.' Like Ellen mentioned, the product photography seems to get better and better and we know that's a huge factor for someone to make a purchase decision. The other con is there are SO MANY AWESOME finds on Etsy, I end up spending as much, if not more, than what I make. And Ellen is partly to blame... she's always sending me links to cool products. Like this really neat internally-lighted furry bra... but I digress. 3. 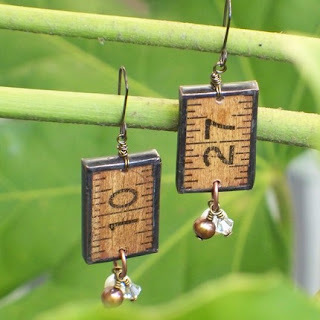 You've taken some super cool old stuff and transformed it into newly usable collectibles, like vintage rulers into earrings, for instance :) Do you call yourselves "crafters"? On your list of favorite felons, is Martha Stewart in the top five? ELLEN: I like to think of us as artists, rather than crafters. “Crafters” has such an embroidered duck feel about it for me. Snort! Ask Kim how I combat that in my own house with my husband. He tries to get it, but, well, he just doesn’t. Basically Kim and I LOVE, LOVE, LOVE to take some vintage, faded cast-aside and transform it into something beautiful. It’s really all about the transformation for me. 4. What's your favorite vintage item you have at home? One of mine is an old WWII ration book with someone's name written on the front. Rationing. How weird to think about. ELLEN: Tough question! I have so many things I love. I would have to say my unfinished portraits of women from the ‘30s and ‘40s. They surround me and I love them like family members. Is it the fact that they’re unfinished? Is it the way their faces come up out of a roughly painted-in canvas? KIM: Impossible question! I'm enamored with McCoy pottery and have a growing collection I'm proud of. I also treasure my collection of Nancy Drew books. Oh, and there's my refrigerator ware. Not to mention all the old linen postcards I collect. Oh bother... I can't have just one favorite!! 5. Do you have alter egos? Like, stockbroker by day, Etsy seller by night? How flexible and easy is it to have a smashing little side biz? ELLEN: Absolutely. I’m a writer/EMT by day, vintage transformer by night. I love being busy, and I love how the different things I do challenge me in different ways, but sometimes I need a break from everything to get rejuvenated, you know? KIM: And I own a graphic design firm (just bought from my partner after working with him for over 10 years) so now I'm learning how to balance being a business owner and creator in multiple ways (some days I feel more schizophrenic vs. just having an alter ego). And Ellen is not just a writer... she's one of our area's MOST talented copy writers, and I rely on her to keep me sane in ALL worlds we walk together. Thank you, Ellen and Kim, for opening a window onto your creative space! simply visit Loverly and leave a comment here, telling me another item from their shop that you admire and including your email address so I can contact you if you win! One entry per person. Winner will be chosen via random.org and will be notified via email. Winner will have 24 hours to respond or an alternate winner will be chosen. and the winner will be announced with much rejoicing and playing of tambourines. I have not received any compensation for this giveaway other than a smug satisfaction in highlighting others' talents, gifts, and abilities, and a fluttery feeling in my heart knowing someone will be blessed with a complimentary piece of jewelry. What fun stuff!! And, of course, congratulations on your 300th post! I really liked the Pink, Green and Blue Graphic Image Glass Bauble Pendant Necklace--looks so much fun to wear! Great blog post, Bitty, and equal congratulations on it being your 300th! I am inspired by the drive and innovation of the Loverly ladies, and can't wait to dive into our own Etsy adventure! As far as my favorite Loverly item: the Vintage Bingo Card pendants are fab! I love the overlay of gold text over the classic black font. What an inspiration to create! I love the earrings-super cute. I also really liked the Pink and Brown Flower Graphic Image Glass Bauble Pendant Necklace on their website. Congrats Bitty on your 300th post-blog on!! I love the Love Bug - Stamped Metal Charm. congrats on your 300th post.. i love the Red Enamel Vintage Pin Necklace so pretty..
Great stuff! I Love the Yellow and Brown ART Glass Bauble Pendant Necklace. Thanks! Congratulations on your 300th post and your first giveaway! What loverly things! I like the Sweet Robin Cherry Blossom Vintage Postcard Birthday Card. I really like the Vintage Bingo Marker charms - look at my email address! I like the Orange and White Bee Graphic necklace! So many nice things, but the Vintage Ruler Charms are so cool! !